The Conway Ice Rink at Hudson Valley Community College opens for the 2018-19 season on Saturday, Oct. 13 at 4 p.m. Admission is free on opening weekend. The 18,000 square foot rink, located in the McDonough Sports Complex, offers recreational skating for all ages from 4 to 6:15 p.m. on Saturdays and Sundays and from noon to 2 p.m., Monday through Friday. The season runs through Sunday, March 10, 2019. The rink will be closed on Thanksgiving, Christmas Eve, Christmas Day, New Year’s Eve and New Year’s Day. In the event that Hudson Valley classes are cancelled, the ice rink also will be closed. Extended holiday hours during the winter holiday week are noon to 2 p.m. and 4 to 6:15 p.m. on Wednesday, Dec. 26 - Friday, Dec. 28, 2018. Admission is $5 for adults and $3 for children under 12. 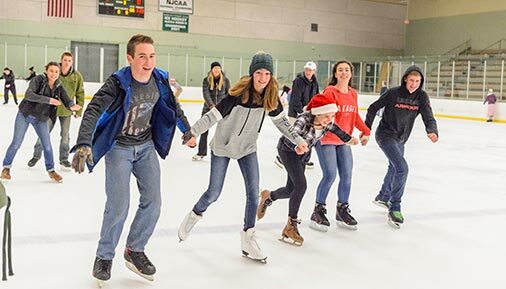 Hudson Valley students can skate for free with a valid student ID, and admission for Hudson Valley faculty, staff and alumni who present a current Hudson Valley ID or Alumni Association membership card is $2. Groups of 10 or more can receive a $1 per person discount with advance notice. Skating classes for children will be offered in 2019 through the Office of Community and Professional Education, a separate entity from the skate shop. For information on enrolling in a class, please call (518) 629-7339.